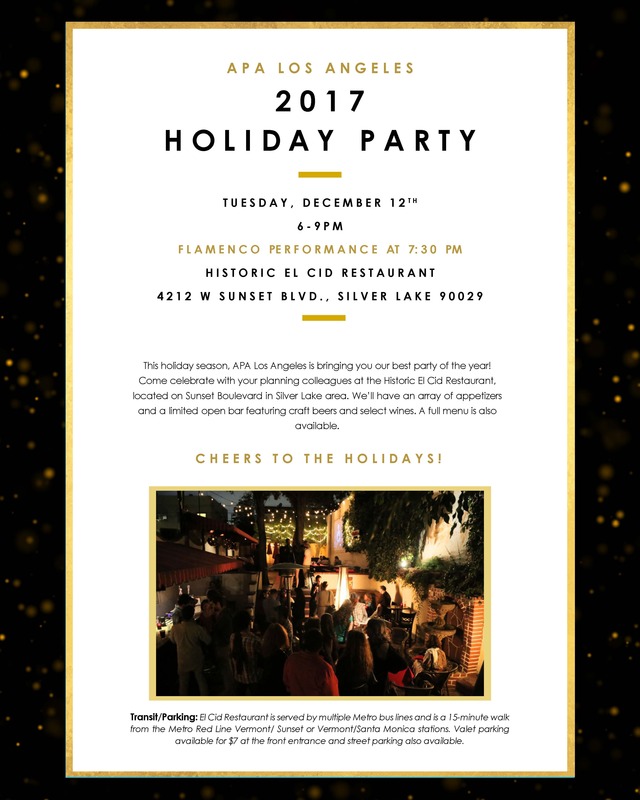 Come celebrate with your planning colleagues at the Historic El Cid Restaurant, located on Sunset Boulevard in the Silver Lake area. We’ll have an array of appetizers and a limited open bar featuring craft beers and select wines. A full menu is also available. And don’t miss a special flamenco dance performance at 7:30 PM! You do not need to be a member of APA to attend, but get your tickets in advance – early bird pricing is available through December 1, and tickets will be $40 at the door. El Cid Restaurant is served by multiple Metro bus lines and is a 15-minute walk from the Metro Red Line Vermont/Sunset or Vermont/Santa Monica stations. $7 valet parking can be found at the front entrance of the restaurant. Street parking is also available.